Well it finally happened. Hell may not have frozen over, but it sure let the demons get through the gates. By that, we mean the 2018 Dodge Challenger SRT Demon was finally revealed at the 2017 New York International Auto Show in April, and discussion of the vehicle is still dominating headlines. Although a lot of specs are still a mystery until the SRT Demon hits the streets, we thought it’s time to write up a performance piece about this muscle car monster. As always, we’ll start from its roots and work our way forward. Not everyone knows this, but the new Challenger SRT Demon actually didn’t start out as a SRT Vehicle. Moreover, it wasn’t even a Challenger. Nope, it was a variation of the 1971 Dodge Dart, called the Dodge Demon. The Demon was available with a 105-hp 198 cubic inch slant six engine, and the Demon 340 was powered by a 318 cubic inch V-8 engine that generated 275 horsepower. There were a couple of problems the ol’ Demon ran into. First up there was a lot of controversy over the name. Second, shortly after its release, federal regulations on gas began and the Demon 340 had to drop its horsepower to 240. The final straw, as they say, was a drop in sales. It seemed that the world wasn’t ready for the beast, thus the Dodge Dart Demon was put to rest after the 1972 model year. 44 years later, the Dodge Demon returned, and as an SRT vehicle no less. The same organization that spawned the Dodge Viper SRT, Dodge SRT 392, and Dodge SRT Hellcat gave life back to a once perished vehicle. The world is different now, and there aren’t as many people who will sneer at a vehicle just because it’s called a “Demon.” Plus, with changing federal regulations, Dodge is able to push the envelope a little more, and that means a whole new level of horsepower. With the Dodge SRT Hellcat already at 707 horsepower, is it any surprise? Under the hood of the Dodge SRT Demon is an all-new engine. At first look, some people think it’s just a larger version of the SRT Hellcat given the name, a supercharged 6.2-liter HEMI Demon V8 engine, but that’s pretty far from the truth. The main components that carried over from the SRT Hellcat engine are the cylinder heads and engine block. Other than that, the engines are very different. The supercharger on the SRT Demon engine is 2.7 liters, which is 0.3 liters bigger than the 2.4-liter supercharger on the SRT Hellcat engine. Additionally, 97 new parts have been integrated into the Demon’s engine, including a new crankshaft, new connecting rods, new pistons, a new steel camshaft, and a new valvetrain. In addition, the boost pressure has increased from 14.5 psi from 11.6 psi, and the engine is no longer paired to a manual transmission. Instead, it’s linked to an automatic transmission with a transbrake function to lock the output shaft of the transmission as the engine revs up. 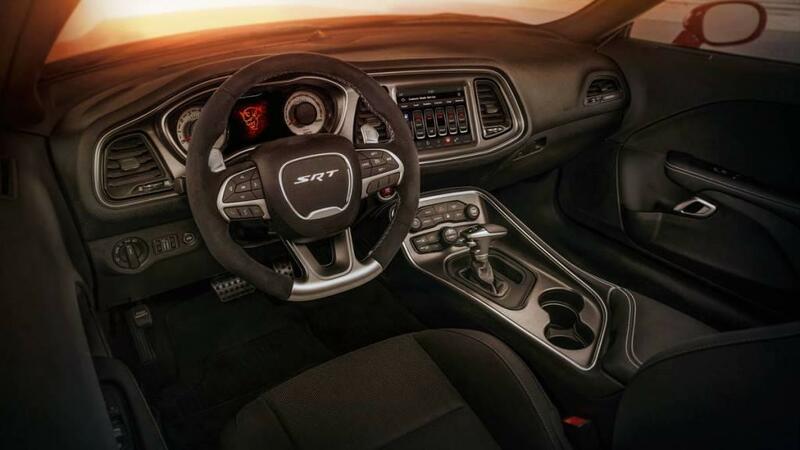 With steering wheel mounted paddle shifters, unlock the transbrake and let the Dodge SRT Demon fly, launching with over 770 lb-ft of torque and 840 horsepower. With all that revved up power sent to the rear wheels, the Demon actually pops a wheelie, with the front tires completely off the ground – a Guinness World Record for an automobile traveling 2.92 feet on only two wheels no less. All of that power makes the 2018 Dodge Challenger SRT Demon the world’s fastest factory production car. The last recordings have measured its g-force at 1.8 G’s. It accelerates from 0-60 mph in just 2.3 seconds, and covers a quarter mile in 9.65 seconds at a a max speed of 140.09 mph. That’s the power of the SRT Demon! How does one control all that power? Well, on the underside of the SRT Demon is a Bilstein Adaptive Dampening Suspension for a comfortable ride and supreme handling. Consisting of steel two-piece vented and slotted rotors, measured at 14.2 inches in the front front and 13.8 inches in the rear, in conjunction with four-piston Brembo front calipers and two-piston Brembo rear calipers, one can bring the Demon to a full stop from 60 mph in 97-feet. A novel liquid-to-air intercooler chiller system has been integrated, and it’s a little complicated to explain. In laymens terms, it uses the air conditioner system as part of the air intake to keep the engine cool, and that’s just the beginning of improvements found on the SRT Demon. 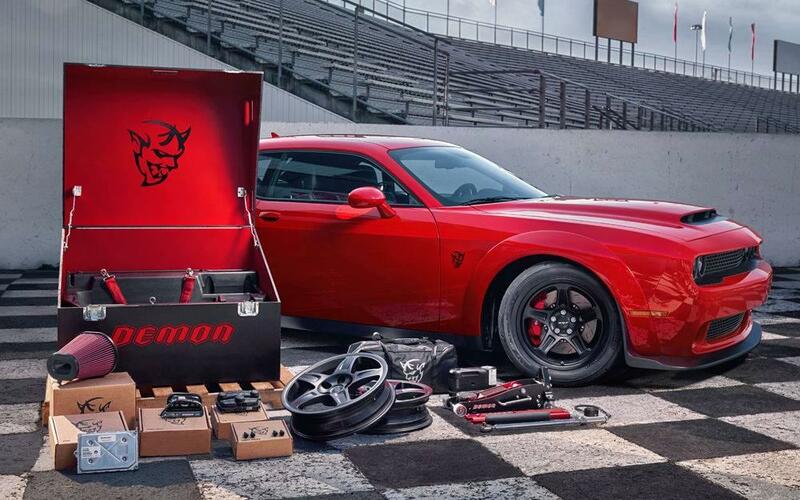 If drivers want more power, they can dig through the serialized Demon Crate for a ton of stuff to turn the SRT Demon into a true drag racer – narrow front runner aluminum drag wheels, performance parts, tools, jacks, an air filter, a tire pressure gauge, and a powertrain control module along with a switch module to switch over to high-octane gas for the fuel source and remap the engine. The look of the Dodge SRT Demon can be summed up in one word – fierce. There’s plenty of Dodge heritage style, such as wide-body fender flares, wider wheel arches, a 45.2 square-inch Air-Grabber hood scoop that induces over 1000 cubic-feet of air per minute, two more air intakes where the inner headlights would rest, a rear black spoiler, and of course the Demon logo on either side. It all rides on 18-inch Demon-branded Nitto street-legal drag radial race tires. The vehicle will be available in 14 exterior colors: B5 Blue, Billet Silver, Destroyer Gray, F8 Green, Go Mango, Granite Crystal, Indigo Blue, Maximum Steel, Octane Red, Pitch Black, Plum Crazy, TorRed, White Knuckle and Yellow Jacket. The interior of the 2018 Dodge Challenger SRT Demon has been completely changed. There is only one seat, the driver’s, with a drag race harness bar and straps replacing the seat belt, and nets in the back to hold a helmet. An owner can buy a passenger seat for $1 if they wish, and the tools to install it are included in the Demon Crate. At the moment, a simple two-speaker system makes up the stereo to keep the car light. That is, of course, just the usual stuff. The SRT Demon will come with new drag technologies, such as a brake-free launch system to increase launch boost pressure, drag-mode suspension tuning, and the touchscreen displays various performance pages with real-time dyno to log data so drivers can keep track of their lil’ Demon’s performance, and a multi-information display sits between the speedometer and odometer. The seats are leather and embroidered with the Demon logo. There are also plenty of buttons specific to the Demon integrated into the center console. Word is, Dodge plans to build only 3,300 Demons this summer, with 3,000 allocated for the U.S. and 300 for Canada. Pricing isn’t exact yet, but it’s said to be below six figures, or $100,000. That’s pretty surprising, but gotta play the right cards if this venture needs to break even. Be sure to keep in touch and let us know if you’re interested in owning a SRT Demon of your own.